EU travel regulations updated - what you need to know! Wright County, Minnesota - Bertram Chain of Lakes Park action needed. The Alaska Dog Mushers Association to hold first race of the season! Major race coverage of La Grande Odyss�e 2010! Blayne �Bud� Streeper from British Columbia will return to the International Pedigree Stage Stop Sled Dog Race to defend his 2010 IPSSSDR championship. Streeper, who won the IPSSSDR in both 2010 and 2004, is one of 23 mushers who will be competing in the 2011 race January 28 � February 5, 2011. The Sheep Mountain 150 is a 150-mile sled dog race to be held December 18-19, 2010. The race starts and finishes at Sheep Mountain Lodge at mile 113 of the Glenn Highway. The race starts Saturday at noon. The winner usually finishes Sunday around noon. December 6, 2010, Monticello, MN � Mushing USA (MUSA), the national governing body of sled dog sports in the USA, has made its final selection for competitors to represent the USA in the IFSS (International Federation of Sleddog Sports) Winter World Championships in Norway in February and March, 2011. The Iditarod Sled Dog Race is only a dream for most amateur mushers. To reach that goal is a lot of hard work, expense and time commitment, especially for mushers in the lower 48. But what about the musher who has no aspiration to run the Iditarod, but would like to have the experience without the long drive to Alaska? 42 teams now signed up for the 2010 Sheep Mountain 150 Sled Dog race to be held December 18-19, 2010, including current Iditarod Champion Lance Mackey, Aily Zirkle, and defending Sheep Mountain 150 Champion Jessica Hendricks. European Council Decision N� 388/2010 of 6th May 2010 regarding travel regulations has been amended for sled dogs. Monticello, Minnesota USA �The IFSS and the Race Giving Organization (RGO) of the World Championships 2011 in Norway on snow have finalized the list of competitions proposed in the three race sites, R�ros, Hamar and Holmenkollen/Oslo, all in Norway. Sled dog racing without snow? Yes, called dryland racing and is catching on all over the United States after years of popularity in Europe. Mushers will compete for a $10,000.00 purse in Canicross, Bikejor, Rig and Scooter classes at the East Meets West Dryland Championship on October 30th and 31st, 2010, at Warner Lake Park in Clearwater, Minnesota. director of the International Pedigree Stage Stop Sled Dog Race (IPSSSDR), will send off the U.S. Capitol Christmas Tree from Jackson by a sled dog team of sixteen on November 6, 2010, in a Capitol Christmas Tree celebration scheduled to take place at 4:30 p.m. on Jackson�s Town Square. Mike and Laura have helped many children with life threatening illnesses get their wishes granted through �Can�t Depend on Snow� and the Make a Wish Foundation. Now it�s our turn to help them. Sue Donkersloot, 57, of Steinbach passed away Tuesday, September 28, 2010. Services will be held Saturday, October 2, 2010 at 2pm at Steinbach Emmanuel Evangelical Free Church. September 23, 2010 (Fairbanks, Alaska) � The Yukon Quest will hold its 2010 Rookie Workshop in Fairbanks on Friday, October 8th at the ADMA Sled Dog Symposium in Pioneer Park from 10AM � 4PM. Note: There are a number of mushers, racing moments and races (Fur Rondy, ONAC and Yukon Quest) included in the vote. You can view a complete listing at www.alaskasportshall.org/documents/2010list.pdf before you vote. You can write-in inductees under each category too! Dr Arleigh Reynolds and UAF coach Scott Jerome to discuss endurance athlete physiology in a free public seminar during the 2010 ADMA Sled Dog Symposium. This Sunday (Sept. 19) at 10:00 PM, the Outdoor Life Network (OLN) will broadcast the Canadian premiere of �UNDERDOG�. The Midwest Iditarod Teacher�s Conference will take place September 24th in Curtis, Michigan. The 2nd Annual Midwest Mushing Symposium will take place on Saturday, September 25, also in Curtis, Michigan. Information for Canadian mushers on how to apply to attend the 2011 IFSS World Championships in Norway. August 31, 2010 (Ocho Rios, Jamaica) � Jamaica Dogsled Team musher Newton Marshall will arrive in Alaska on Wednesday, September 1st to begin training for his impressive schedule of races in 2011. Anchorage, AK - August 30, 2010 - Rondy World Championship Sled Dog Races purse announced: $80,000 plus $1,000 minimum for �Day Money Purses� - the highest ever for sprint racing! The two greatest European sleddog races, the Finnmarkslopet in Norway and La Grande Odyss�e Savoie Mont Blanc in France have together decided to create a new championship in this growing sport: the Arctic Alps Cup. (Duluth, MN) The John Beargrease Sled Dog Marathon is honored to host Jeff King, Iditarod Champion as the guest speaker at the Annual Beargrease Gala Dinner on January 28, 2011. On February 5th and 6th, 2011 the nation's top skijorers will compete in Minneapolis, MN for national titles in one and two dog skijoring. I want to inform you about new transport rules for pet animals in the European union. It is maybe the death of the European sleddog sport. Wright County, Minnesota is in the process of developing a plan for the new Bertram Chain of Lakes park. The park is still in its infancy, and will eventually grow to 1200 acres. Located just southwest of the city of Monticello, Minnesota, it is easily accessible via I-94. Jackson, Wyoming � July 27, 2010 � The International Pedigree Stage Stop Sled Dog Race (IPSSSDR) has filled its roster with 25 teams registered for the upcoming January 28 � February 5, 2011, event, announced Race Director Frank Teasley. Registration for the event is now closed and interested teams will be placed on a waiting list. Jackson, Wyoming � June 7, 2010 � The 2011 International Pedigree Stage Stop Sled Dog Race (IPSSSDR) roster has been expanded from 20 to 25 teams announced Race Director Frank Teasley. Currently there are 20 teams registered for the race. Teams registered in the 2011 event include the reigning champions of distance mushing, Lance Mackey and Hans Gatt; Iditarod veteran Ryan Redington, and Fur Rondy Sprint Champion Blayne �Bud� Streeper. Streeper won the IPSSSDR in 2004 and 2010. The largest sled dog race in the lower 48 states is slated for January 28 � February 5, 2011, starting in Jackson, Wyoming and traveling through small Wyoming communities before finishing in Park City, Utah. With its unique stage stop format, the IPSSSDR has become a popular mushing event attracting the world�s top competitors. Pedigree� Food for Dogs is the title sponsor of the IPSSSDR. The Pedigree� brand actively supports a wide range of programs that promote responsible pet ownership and highlight the contributions dogs make to society. For more information, visit the race website at www.wyomingstagestop.org/ Contact the race via e-mail at bark@wyomingstagestop.org or telephone at 307.734.1163. Don May died in a motorcycle accident May 28, 2010. Visitation is Monday June 7, 2010, 12:00 Noon. Funeral is Monday, June 7, 2010 1 pm. Re-route portions of the Tomahawk Snowmobile Trail onto unplowed system roads. Decommission some snowmobile bridges. Designate non-motorized winter routes for skiers and dogsledders. We really need peoples help on this issue now. The Forest Service has released the plan for comment period and it would help a lot if people would do so in favor of the trail. If you ever think you might come to the area and train please let them know. This needs to be done before June 7th. Jackson, Wyoming � May 19, 2010 � Nineteen teams have registered for the 2011 International Pedigree Stage Stop Sled Dog Race (IPSSSDR) announced Race Director Frank Teasley. As a result, Teasley is considering expanding the roster to 25 teams; he will make the decision June 1. The reigning champions of distance mushing, Lance Mackey and Hans Gatt have announced that they will compete in the 2011 event. Other racers expected to compete are Iditarod veteran Ryan Redington and Fur Rondy Sprint Champion Blayne �Bud� Streeper. Streeper won the IPSSSDR in 2004 and 2010. The largest sled dog race in the lower 48 states is slated for January 28 � February 5, 2011, starting in Jackson, Wyoming, and traveling through small Wyoming communities before finishing in Park City, Utah. The International Pedigree Stage Stop Sled Dog Race was founded in 1996 by Frank Teasley to make sled dog racing more accessible to the public. For more information, visit the race website at http://www.wyomingstagestop.org/; contact the race via e-mail at bark@wyomingstagestop.org; or telephone at (307) 734-1163. Charlie Berger, DVM now offering �Of Wolves and Dogs...from the Big Bang to Chihuahuas� seminars to the public. Charlie Berger may no longer be running a full time veterinary clinic, but he�s retired from little else. When he�s not working odd-hour emergency shifts at a clinic near his East Thetford, Vermont home, New England�s version of the Energizer Bunny is almost always on the go. No moss gathers under his feet. In addition to serving for many years as a volunteer vet for the Iditarod, Yukon Quest and other major sled dog races, Berger, in a former life, has owned and bred Alaskan Malamutes (Brigadoon Kennels). For years he also traveled the countryside with his two North American gray wolves, Frannie and Farley, offering presentations to kennel clubs, schools, colleges, and ecological centers on the biology, ecology and politics of wolves. This �old dog� has recently begun teaching �new tricks�. 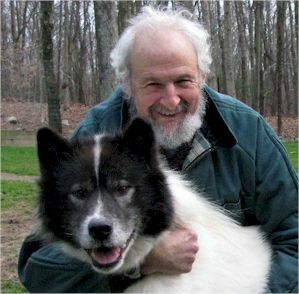 Broadly experienced in comparative pathology and disease processes in wild animals and humans, as well as being a life-long observer of natural history and evolutionary theory, appreciating the constant changes during the Earth's long geological time, Berger, in 2008, was asked by the prestigious Dartmouth College in New Hampshire to design and teach a course. �Of Wolves and Dogs...from the Big Bang to Chihuahuas� was a huge success. Not content to rest on his laurels or sit by the woodstove or on the covered porch of his rustic Vermont log home, Berger decided to take his program on the road, offering two-hour, one and two-day seminars to dog clubs, schools, and civic, conservation and other organizations. Although he�s only been presenting these seminars to the public for about six months, and the ink on his new website is barely dry, Berger�s already a hot commodity. It looks like he�s going to have to paddle down those untamed Canadian rivers a lot faster from now on in order to get back to civilization and his busy date book! Richard Beck of Yellowknife, Northwest Territories has won the 63rd Northern Manitoba Trappers Festival World Championship 10 Dog Sled Dog race. He first won the race 25 years ago, and his last victory came in 1997. Chris Turner of The Pas, Manitoba won the Jack Mcphail race, which is named after his Grandfather. The Junior Race was won by Wyatt Cook and the 4 Dog race was won by Daniel Crow. Due to lack of snow at the Cannington site, the regular sprint races have been revised. The festival committee is working to put in a smaller race track that 3 and 4 dog sled teams and 1 and 2 dog skijoring teams can compete on. We are currently working on a 5/8 mile track around the perimeter of McLeod Park. We are also looking at possible extension of the 5/8 to 1.5 miles if the current falling snow co-operates. The purse is reduced to $6000 and split between the four categories. Driver participation is required for both days of competition and the race is based on two day accumulated time. Driver�s meeting both days will be held at 8:30 with registration prior to the meeting. The committee is waving all registration fees for this year. The Novice Race and the Kid and Mutt Race are still on. These adjustments are being made to help keep the interest of the spectators that visit the festival and to encourage musher support so we can continue to have this exciting race each year. The Town of Cannington would like to take this opportunity to thank all the mushers that attend this event for your support. The Alaska Dog Mushers Association is excited to announce that the 2010 Annamaet Gold Run Championship Sled Dog Race will be held at the Chena Lakes Recreation Area on Saturday February 20 � 21 starting at 11am. This is the first ADMA race of the season! Chena Lakes Recreation Area offers great viewing of the race events. Watch as dog teams seemingly fly across the trail at over 20 mph! Come and be part of the action of the 2010 Annamaet Gold Run Championship Sled Dog Race! Bring the entire family, meet the mushers and see the sled dogs up close as they prepare to race. Events include skijoring, 4-dog, 6-dog, and 10-dog events. Sign-up and Draw will be held at 6.30pm on Friday February 19th at Mushers Hall on Farmers Loop. After a 10 days race, Emil Inauen from Switzerland wins the 6th edition of La Grande Odyss�e Savoie Mont Blanc in 40h17mn, that is 23 minutes ahead of the competitor in 2nd place, Radek Havrda from Czech Republic. The mushers, sled drivers and their huskies have travelled almost 1000 kilometers in 10 stages and climbed more than 25 000 meters of height difference through the most beautiful areas of Savoie Mont Blanc (Haute-Savoie and Savoie). At the end of the 10 stages with an average of 100 kilometers per stage, Emil Inauen from Switzerland, has been the most impressive musher. He bravely passed the steep hillsides, the frigid temperatures, the heights and snow storms and managed to bring his dogs to the finishing line. This incredible feat was achieved after years of efforts and training but also through the unique bond he has forged with its canine athletes, real snow marathon runners. In adversity and when fatigue occurs, only the love of dogs to their master can push them to excel. This 6th edition has been the most intense of all. Never has the competition been so tight and never have the dogs and mushers been that well prepared for this incredible challenge. The podium is completed by two Czech mushers, Radek Havrda, winner in 2009 and Jiri Vondrak, who fought hard in this race to reach the podium. During the final stage, he steals the third place from Petter Karlsson, the Swedish winner in 2008. The first French is Jean-Philippe Pontier, who ran the race fantastically. He moved to Norway this summer to give himself the means to improve his performance. It seems to have paid off. The leading woman of the race, Barbara Inauen, spouse of the race winner, finished in 10th position. La Grande Odyss�e Savoie Mont Blanc is only 6 years old and already into the elite club of the greatest sled dogs races in the world with the Iditarod (Alaska), the Yukon Quest (Canada-Alaska) and the Finnmarksl�pet (Norway). La Grande Odyss�e Savoie Mont Blanc started January 10th with 4 days in the heart of Les Portes du Soleil, then went through Meg�ve, Notre Dame de Bellecombe, and finally through Haute Maurienne Vanoise. In total over the 110 stations of Savoie Mont Blanc, more than 24 were involved in the race. "This year was a watershed in the history of this race by the popular craze (over 60 000 spectators) and its very strong media coverage. The future of La Grande Odyss�e Savoie Mont Blanc is guaranteed by the signing of the 2001/2013 agreements with Espace Diamant, Haute Maurienne Vanoise and Les Portes du Soleil (only for 2011)" said Henry Kam creator with Nicolas Vanier and event organizer. Next year, the 7th edition of La Grande Odyss�e Savoie Mont Blanc, will take place from January the 8th to the 18th of 2011. A meeting yesterday affirmed that conditions currently exist for a decent trail and the race is a "go". To reiterate: the focus is to afford entry level mushers a learning experience under real time conditions. The race was originally established to that end and remains so. Professional mushers are invited to enter and use the race as a training tool with opportunities for pass training and a bowl of good stew at the rest stop, but no payday at the finish line...as DB would have it. Space limits the race to 25 teams. The rules explain particulars of vet requirements, logistics, and directions. The Mail Run weekend is almost here. Organizers are busy with last minute details, fingers are crossed that Mother Nature will co-operate and ensure great trails with reasonable temperatures, participants are filled with anticipation and perhaps a little anxiety. There will be participants from as far away as Manitoba, the NWT as well as from throughout British Columbia and elsewhere. There are an encouraging number of participants aged 16 and under and not only does this speak well for the future of the sport of dog mushing but it also represents a fulfillment of the vision of Holger Bauer, a much missed Mail Run participant and organizer who was killed in a 2007 logging accident. Participants are encouraged to download the Participation/Registration Form from the website and to get it in to organizers by January 18th. We are requesting early registration this year, to assist with pre-event planning and to ensure that all participants receive a warm welcome at the Thursday night Mushers� Meeting. If there are those participants who only want to take part in the Barkerville Dash from Barkerville to Wells, they must also register and pay the registration fee however they may register at the Barkerville parking lot in the hour before the Dash, which is slated to commence at 2:00 p.m. on Sunday January 24th. The trail, which actually does follow the original Cariboo Waggon Road route, is now ready and this will allow not only the Mail Run participants to use the trail but also those participating in the Cariboo Jack Ski Trek on Saturday January 23rd. On Saturday night, January 23rd, the annual Mail Run banquet and auction will take place at Troll Resort. The meal begins at 6:00 p.m., there will be socializing in the Troll lodge beginning at 5:15 p.m. This will all follow the famous Mushers� Sports that will take place at approximately 2:30 p.m. on Saturday afternoon at Troll. It is an excellent opportunity for spectators to come and see the dog teams and to meet the mushers and other participants, then to take in the Mushers� Sports. Anyone wishing to attend the banquet must purchase a ticket, the cost is $15.00 for adults and $10.00 for children aged 12 and under and seniors aged 65 and over. You can reserve or purchase a ticket by calling Margaret at 250 992-9143 or emailing her at Margaret@dogsledmailrun.ca Other Mail Run organizers will also have tickets for sale. The auction, which follows the banquet promises to be a fun time as well, there will be some very special, one-of-a-kind items up for bid. Mail Run organizers are very excited about a special connection between the Mail Run, the Gold Rush Trail, the City of Quesnel, the students of School District 28 and the upcoming 2010 Olympic Games. The City of Quesnel will be sending a unique and special greeting to every member of the Canadian Olympic team. Mayor Mary Sjostrom is preparing this written greeting on behalf of the City of Quesnel, but she has some very special help and support. Part of the Grade IV Social Studies curriculum is the study of the Cariboo Gold Rush and the Gold Rush Trail�.the route followed by the Mail Run. As part of their studies, Grade IV students will also be writing personal greetings to Canada�s Olympic athletes and a student�s letter will be placed in each envelope along with Mayor Sjostrom�s letter before being carried over the Gold Rush Trail by dog team and then forwarded to each individual Canadian Olympic athlete. There is universal enthusiasm for this great project. There are two weeks to go before the start of the Mail Run. Participants are encouraged to register. Everyone is encouraged to purchase their Mail Run envelopes, which must then be placed in the special Mail Run post boxes or returned to organizers by January 19th. LGO News, the daily news broadcast of La Grande Odyss�e Savoie Mont Blanc, hosted by Laure-Anne Chiche, fully subtitled in English. Each day, a 12 minutes show divided in two parts. First part: News with results, rankings, interviews and analysis. And part two, the magazine. Encounters with those you make the race, those who run the race, those who support the race. But especially, beautiful pictures of the teams, the dogs and the landscapes of Savoie Mont Blanc. Follow the race LIVE. Virginie Maupou will give during each stage, live from the race headquarters a newsfeed with every interesting detail to folllow the race. Who's leading? Who's catching up with who? Who has stopped? Who's the fastest? Virginie will make you live the race like if you were there on the trail with the mushers. Stay tuned, first session Sunday the 10th 4:30 PM! During the whole race, don't miss the LGO Blog (Today News) and live LGO 2010 from the inside. Thibaut Branquart will feed this blog with pictures, videos, interviews, comments, anecdotes. Everything you need to know about the race will be there. Everyday, you'll find the best pictures of the day taken by the official photographers of the race. Don't miss those!